Looking for gentle dental care, at a clinic perfect for the entire family? From small children to seniors, our “gold standard” promise ensures each and every visit is pain free and enjoyable. To make things easier for you, you can request family-block appointments during our extended hours. Health Insurance, VIC Dental Scheme, Pensioner & Children are all at reduced fees, making our dental clinic services even more affordable for families. We also provide dental payment plans if you need. We understand some people are a bit nervous about visiting dentists – that’s why “happy gas” is available for treatments. As well, dental treatments are covered under our warranty, ensuring you peace of mind. You’ll find ample parking on-site. 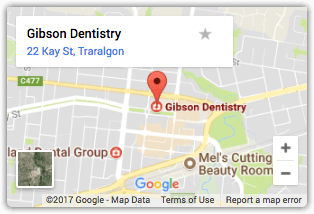 And, we’re conveniently located just one minute’s walk from Stockland Traralgon. Flossing is very effective at cleaning between the teeth, where the toothbrush can’t get to. We recommend flossing at the least three times a week!